This entry was posted in Recipes and tagged pasta, pizza on August 26, 2018 by The Yellow Pine Times. 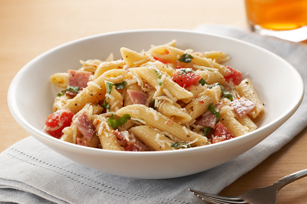 In a large pot of salted boiling water, cook pasta according to package directions until al dente, less 2 minutes. Meanwhile, in a large cast-iron skillet over medium-high heat, melt butter, whisk in flour, and cook for 1 minute. Add tomato paste and whisk in milk until smooth. Add oregano, red pepper flakes, and 1/2 teaspoon salt and bring to a boil. Simmer for 1 minute on medium heat. Fold in half the cheese and add drained pasta. Top pasta with remaining cheese and sprinkle pepperoni all over. 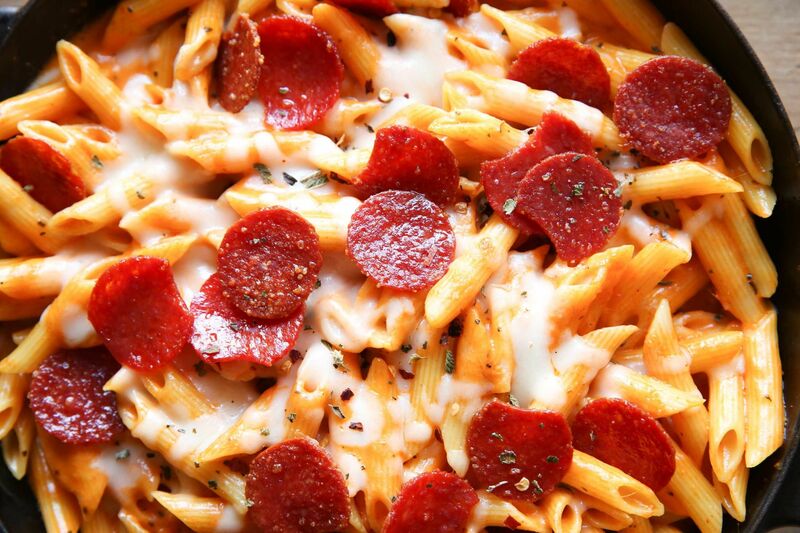 Bake until pepperoni is crispy and pasta is bubbling, 10 minutes. Serve immediately. 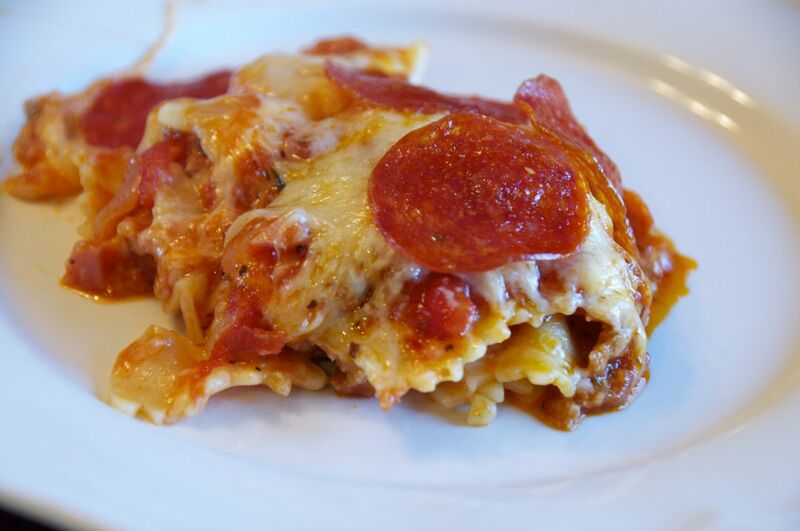 This entry was posted in Recipes and tagged pasta, pizza on April 22, 2018 by The Yellow Pine Times. Cut the block of cheese into 28 squares. Line up the rolls in a greased 9×13 in pan. This entry was posted in Recipes and tagged pizza, snack on February 25, 2018 by The Yellow Pine Times. Preheat oven to 375 F and bring a large pot of salted water to boil. Cook pasta according to packaging directions, or until just al dente. In a large skillet or Dutch oven over medium-high heat, cook sausage and onion until meat is browned and onion is softened and translucent. Season with salt and pepper, garlic powder, basil and oregano. Drain off excess grease and pour in spaghetti sauce and cooked pasta. Cook for 2 minutes, then remove from heat. 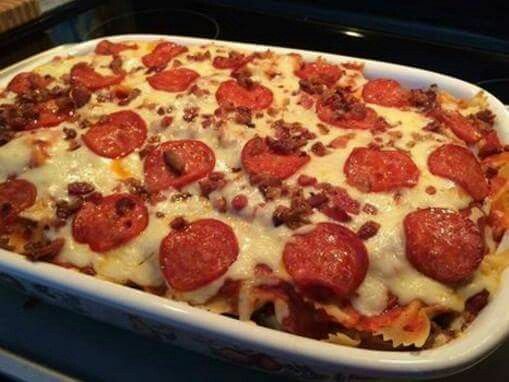 Pour sausage and pasta mixture into baking dish and top with parmesan cheese. Evenly spread mozzarella cheese over the top and lay our pepperoni on top of that. 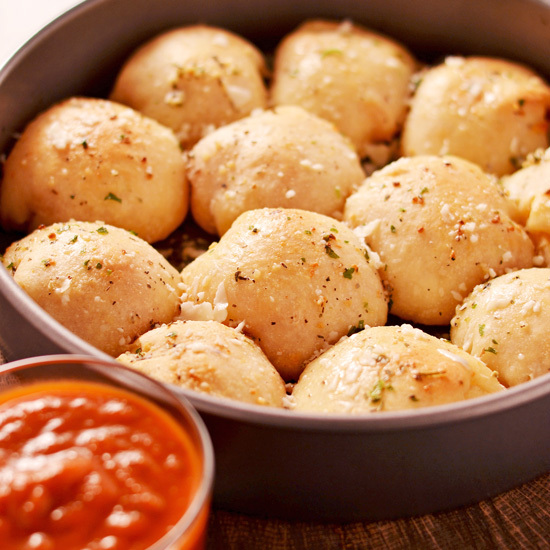 Place baking dish in oven and bake for 40 minutes, or until cheese melted and bubbly and dish is warmed through. This entry was posted in Recipes and tagged casserole, pizza on February 18, 2018 by The Yellow Pine Times. Preheat oven to 375 and mist a 9” x 13” baking dish with nonfat cooking spray. Using a meat mallet, flatten each chicken fillet to about 1/3” thick. Season both sides with salt and pepper. 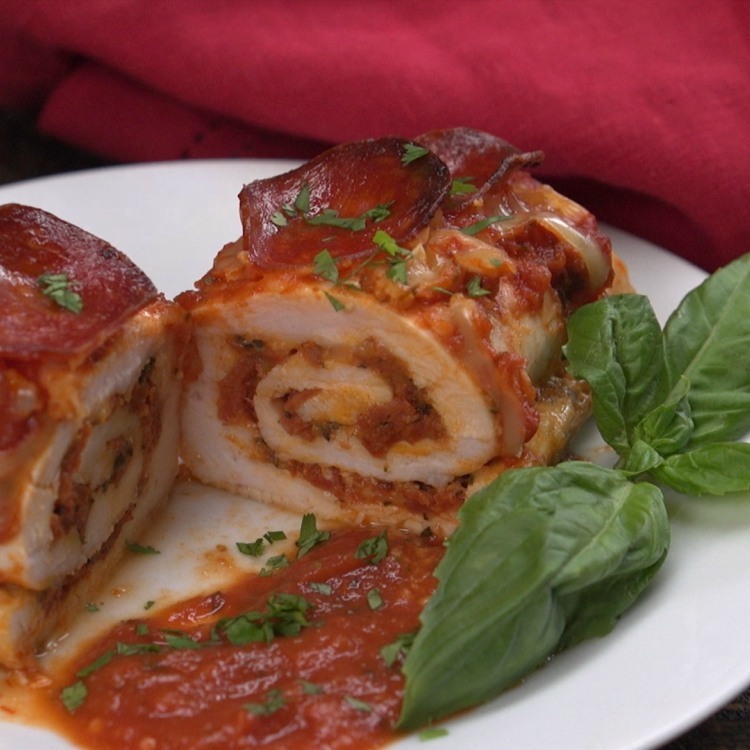 Spread 1 tbsp of pizza sauce on one side of chicken. One on half of the sauced side, lay 1 slice (0.5oz) of the mozzarella cheese, and 8 slices of the turkey pepperoni. Fold chicken fillet in half, being careful to try and keep the filling inside and rolling in the edges, if possible. Seal with toothpicks, if needed. Prepare dredging station by placing the flour in one shallow bowl, the liquid egg whites in another, and the Panko, garlic powder, Italian seasoning and additional salt & pepper in the third. One by one, coat each piece of chicken in the flour, then the egg then the Panko seasoning mixture. Be careful to try and keep the open side of the pocket pinched closed and keep the fillings in (this is why I recommend the toothpicks in Step 3). Place in prepared baking dish, and bake, uncovered for about 25-30 minutes, or until chicken is fully cooked through and outside is golden brown and crispy. Pour remaining pizza sauce over chicken right after it is removed from the oven, and serve. This entry was posted in Recipes and tagged chicken, pizza on February 11, 2018 by The Yellow Pine Times. Preheat oven to 350 degrees. Spray a bundt cake pan with nonstick baking spray. Set aside. In a large bowl, stir together garlic powder, Italian seasoning and shredded cheese. Set aside. Unroll pizza dough and cut into 1 1/2-inch squares with a sharp knife. 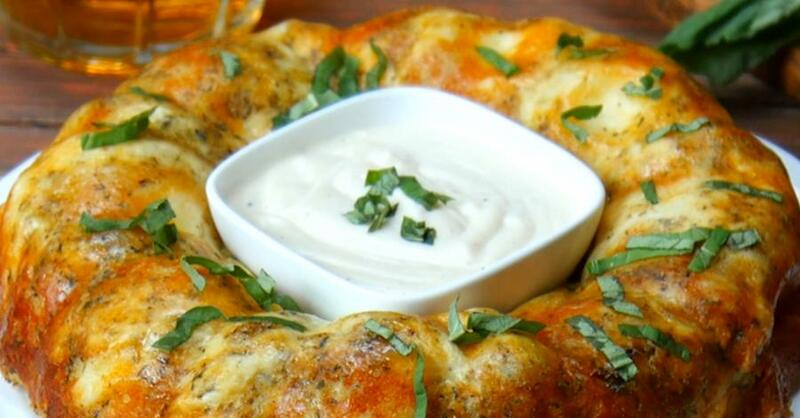 Wrap each square of dough around a mozzarella ball and dip into 1 cup of Alfredo sauce. Dip into prepared shredded cheese mix. Place inside bundt pan, creating a uniform layer all the way around the pan. This entry was posted in Recipes and tagged bread, pizza on February 4, 2018 by The Yellow Pine Times. Boil water and salt for pasta. Once it starts boiling, add pasta. Brown meat in a separate frying pan. When pasta is cooked, drain. In a lightly greased 9×13×3 inch pan, pour a small amount of sauce to lightly coat bottom. Add a layer of pasta and add 1/2 of sauce, can of tomatoes, garlic powder, and oregano. On top of pasta, layer the ground meat, then add a layer of pepperonis. Sprinkle parmesan cheese, and Italian cheese. And layer more pepperoni. Top with bacon bits and anything else you like just like a pizza! This entry was posted in Recipes and tagged casserole, pasta, pizza on September 17, 2017 by The Yellow Pine Times.